Cowal is part of Argyll and the Islands region, which is in the south west of the Scottish Highlands. Argyll and the Islands actually boasts more coastline than the country of France! Argyll has a population density of only 13 inhabitants per square kilometre. To put this into some kind of perspective the city of London has 4,542 inhabitants per square kilometre and Glasgow has 3,390. The Cowal area is about 50 km long and between 12 and 25 km wide. The population of Cowal is only around 20,000 people, with the majority living in the coastal town of Dunoon. There is an abundance of natural, scenic, historical and cultural heritage available to see on the Loch Lomond & Cowal Way. We have provided only a small selection here, to illustrate the diversity. Please purchase our Loch Lomond & Cowal Way Guide from our online shop for more choices and information. Asgog Castle – now a ruin, this castle was originally built in the mid 15th century by the Lamont clan to strengthen their dominance in this area. In 1646 the Campbell clan besieged the castle, in revenge for previous attacks on their land. On surrendering, the Campbell’s burned the castle and slaughtered the rival clan members. Millhouse Powder Mill – gunpowder was manufactured here from 1839 to 1921. The ruins of the Mill are visible from the path. There is a monument at Millhouse which includes a small cannon that was used to test the powder. The rusted ball stuck in its barrel confirms the unpredictable nature of this activity. 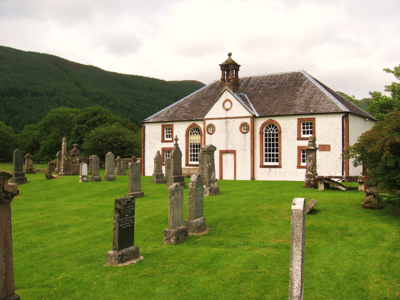 Kilmodan Church and Carved Stones – a beautiful building built in 1783, strangely enough with three different entrances. Folklore has it that there was a separate entrance for each of the three main Campbell families, so they could speak to God without having to speak to each other. The graveyard has a fine selection of 14th and 15th century carved stones. Dunans Castle – the impressive ruins of Dunans Castle are located at the head of Glendaruel. As well as the castle, points of interest include a unique A-listed Telford Bridge, a fine collection of rhododendrons, rare native flowers, wild fungi, ancient trees and an excellent circular walk. Strachur Smiddy – now converted into a museum and craft shop, for most of its working life it was in the hands of the Montgomery family, who provided four generations of blacksmiths. The first recorded reference to this Smiddy was in 1791. The visitor attraction is now managed by a local trust. Struth Ban Falls – between Strachur and Lochgoilhead and located on Loch Lomond & Cowal Way, these falls are truly a wonder of nature. Well worth a stop to look at, some walkers have been brave enough to shower in these falls! Drimsynie House – built in the 1850’s by James Neilson, the Glasgow engineer who patented the blast furnace. The house became a hotel in 1958 by the local Campbell family, who have since added a leisure centre and a holiday park with chalets. The Cobbler Mountain – standing at 2,890 feet/881m, this natural feature is not quite tall enough to be recognised as a munro. However, the views are spectacular from the top. Situated at Arrochar and well worth a detour. The Cowal Peninsula offers a wide range of different habitats, from coastal waters to woodlands and hillsides with rivers. This results in a diverse range of flora and fauna. Along the coastal sections of the route visitors may see common and grey seals, porpoises, otters, and a range of seabirds including oystercatchers, red breasted mergansers, eider ducks, herons, cormorants, shags, gannets, fulmars and gulls. The oystercatchers are a local favourite, with their distinctive black and white plumage and long orange bill. Often feeding in flocks on the beach, when disturbed they will let out high pitch shrieks which are mesmerising and unmistakable. The woodland and field areas of the route are home to foxes, badgers, barn owls, roe deer and our famous native red squirrel. The barn owls are one of the few owls possible to see in daylight hours, especially at dawn and dusk. They typically feed on mice and voles. 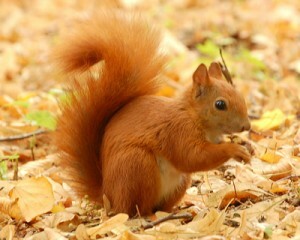 Cowal, like Arran and Kintyre, is one of the last strongholds of the red squirrel. In other areas in the UK, the larger American grey squirrel is present and dominant, and unfortunately this species carries the squirrelpox virus which is fatal to our native reds. 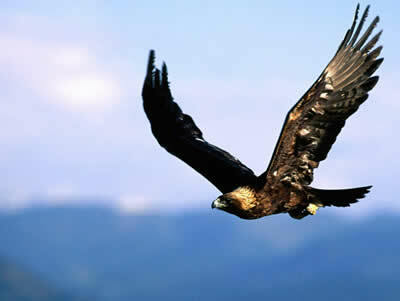 The open hillsides and moorlands of the northern sections of the walk offer ideal habitat for our iconic golden eagles – these majestic birds of prey require huge hunting areas, and because of this Cowal has only four pairs. Other birds of prey in this area include numerous buzzards and the occasional falcon. Black and red grouse also live on this moorland, though are difficult to see. The open hills is also the domain for the red deer (much bigger than the roe deer), which graze in small herds on high ridges.